There are some books I know, if I don’t attempt to review them straightaway, I won’t end up reviewing them at all. It’s because the impact is so powerful, the language so beautiful, I grow afraid I won’t do them justice. 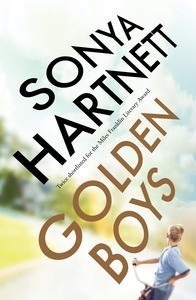 Golden Boys by Sonya Hartnett is one of those books. Golden Boys isn’t nearly as graphic and violent as Lord of the Flies, but its themes – including family violence, grooming, loneliness, isolation and dislocation – are pretty adult. So is the language. It’s rich, poetic, dense. And the pace is slow. Nothing much happens – and yet, everything happens; everything that is painfully ordinary, quotidian, that conveys the angsts and traumas of growing up and learning where one fits in the world. Syd and Bastian look at each other, and it’s like a Jack Russell being introduced to a budgerigar: in theory they could be friends, but in practice sooner or later there will be bright feathers on the floor. His father spends money not merely on making his sons envied but in making them – and the world seems to tip the floor – enticing. His father buys bait. It is how Colt responds to this growing awareness that leads to the climax and denouement on the novel. The ending is dramatic, though not externally earth-shattering, and conveys a sense of truth about the complexity of family loyalties and the burden of carried shame. Apart from its promise as an educational text, it is a worthwhile and moving book to read. This is my first review for both the 2015 Australian Women Writers Challenge and the Aussie Author Challenge. Review copy kindly supplied to me by the publishers via Netgalley. I’ve got this one on my giant pile somewhere – you’ve made me want to drag it out. If only I hadn’t dumped everything received last year in a large tea chest. I know the feeling! I hope you let me know what you think when you get around to reading it, Bernadette. What a talented writer.